The church’s record of holding power – from Emperor Constantine in the 4th century onwards – has involved some terrible acts of coercion, exploitation, and abuse. Yet Jesus set an example of selfless service and started a “humility revolution” that fundamentally transformed the West and the way we think about leadership and power. This segment looks at how Christians in Germany responded to Nazi rule and asks the questions: What has it looked like when Christians have desired power for their own benefit? and, What has it looked like when they’ve chosen to forsake power for the good of others? SIMON SMART: These are the Zeppelin Fields in Nuremberg. 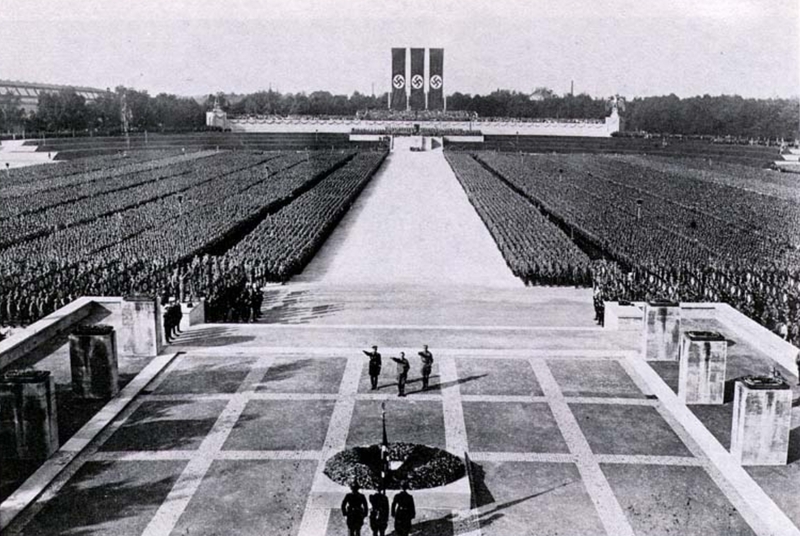 Between 1933 and 1938 the Nazi Party held six enormous rallies here, drumming up mass hysteria with their promise to restore German pride. 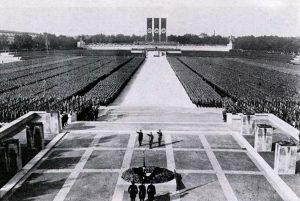 SIMON SMART: This was where Adolf Hitler proclaimed his vision for the Third Reich. And what was the Christian church doing in response to the unfolding madness? Shamefully, not much. Both Catholic and Protestant leaders played into the hands of the Nazis. In fact, many were enthusiastic supporters, literally waving the flag! The story of the church under Nazism is one of comprehensive failure. Church leaders clearly wanted a place at the table in Hitler’s Germany, and they fell over themselves trying to align their faith with the party program. In the words of one prominent German pastor, “Christ has come to us through Adolf Hitler. We have only one task – to be German, not to be Christian.” It says it all really! The German church’s complicity with Nazism is just one glaring example of what happens when the church cozies up to power, at the cost of its core beliefs. The church’s capitulation to Nazism, is in stark contrast to those who, because of their Christian convictions, stood up to the regime. They stand out because they were rare. Normal believers “playing in tune” with Jesus’ original teaching, with beautiful and tragic resonance. JOHN G. STACKHOUSE JR: A minority of German pastors, and some lay people, form what is called the Confessing Church. And they confess that Jesus is Lord, not the Führer – because remember, that’s what it means in German – Jesus is Führer, not Adolf Hitler. And they form this righteous minority of those who are saying we will not go along with the national socialist agenda of bringing all institutions under the power of the state, and particularly of the leader. SIMON SMART: The story of one of those opponents ended here, at Flossenburg concentration camp. Dietrich Bonhoeffer was 39 years old, he was engaged to be married, and had a brilliant career ahead of him. But just two weeks before the Americans liberated this place, in an act of cynical cruelty, the Nazi leaders ordered his execution. Bonhoeffer was a bespectacled, aristocratic church pastor and theologian. He makes for a very unlikely opponent of Nazism, and an even more unlikely conspirator in a plot to kill Hitler. ERIC METAXAS: He’s a genius, he’s a theological genius, so you’d expect him to be kind of an egg head. But he understood, no matter what we say we believe, if we don’t act on it (in other words if I don’t put my money where my mouth is when others are suffering) then clearly I don’t actually believe these things. SIMON SMART: As early as 1933, long before most people had an inkling of where things were headed, Bonhoeffer wrote about the church’s obligation to come to the aid of Jewish people in the face of a tyrannical government. JOHN G. STACKHOUSE JR: Like all Christians everywhere, he believed that we need to bind up those who have been crushed by the wheel of the powerful rolling over them, as he famously put it. But he said something that really made him quite different than most of the Lutherans of his day, who were taught to be compliant with church authority and with state authority. And he said sometimes you have to take a spoke, a stick, and stick it in the wheel. As if you can imagine a bicycle moving along, you’ve got to stick a spoke in and stop the wheel from crushing people. And that was seditious. That’s literally saying you’ve got to rise up against the established authorities, and make them stop what they’re doing. 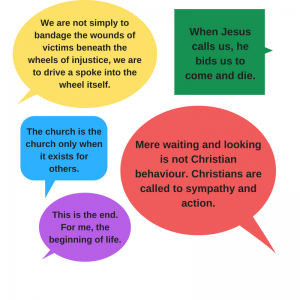 SIMON SMART: His famous “spoke in the wheel” comment was an expression of Bonhoeffer’s commitment to “loving your neighbour”. This would eventually place him squarely in opposition to the state that, in his mind, had given up its right to rule. At the height of German military success in 1940, as church bells rang in celebration at the fall of France, he wrote of the church’s failure to suffer for what is right. ACTOR (DIETRICH BONHOEFFER): The church has witnessed the lawless application of brutal force, the spiritual and physical suffering of countless people, oppression, hatred and murder, and has not found ways to hasten to their aid. The church is the church only when it exists for others. SIMON SMART: On April 5, 1943 Bonhoeffer was arrested, and later connected with conspirators who tried to assassinate Hitler. He ended up here at Flossenburg Concentration Camp, near Germany’s border with Czechoslovakia. Bonhoeffer wrote, “When Jesus calls us, he bids us to come and die.” Sacrifice, service, affinity with the victims, courage, and above all, humility. This was Bonhoeffer’s faith. He clearly believed that there’s eternal significance to all that we do, and that belief shaped his responses to the chaos around him. As Nazi Germany was crumbling, and just three weeks before Hitler put a bullet in his own brain, Bonhoeffer was condemned to death. We are left to wonder what might have happened in Germany if more of those who claimed to follow a crucified Messiah had risked their lives to stand up to power. Do you think Christians/the church are overall more concerned with gaining and maintaining power, or with humbly serving others? What reasons do you have for your answer? Do you associate Jesus Christ more with power or with humility? Have you ever felt that you or a group that you were a part of was being persecuted? How did you feel? What’s the bravest thing you have ever done? Why did you make the decision to do it, instead of taking the easier/safer/less scary option? Brainstorm what you know about the Nazis. Identify as many things as you can about the Nazis and their regime. Look at the following images of life under the Nazis. How do they make you feel? Imagine that you are in Nazi Germany. Some of your neighbours have been removed from their house and you don’t know what happened to them. Write a letter to a friend explaining what has happened and how you intend to respond. You may like to evaluate a range of options and explain why you chose one course of action. How did the majority of church leaders in Germany respond to the Nazi leadership? What does the video suggest was their motivation? There was a movement of Christians who stood against the Nazis. They were called the Confessing Church. Why did they give themselves this name, and what were their reasons for resisting the Nazis? List three key events in the life of Dietrich Bonhoeffer. What does this show us about Bonhoeffer and his faith? In what ways did Bonhoeffer follow the life and teachings of Jesus? 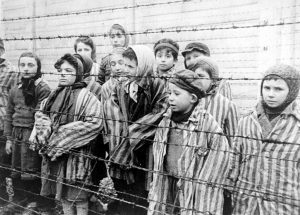 How do you think things might have been different if more Christian leaders had stood up to the power of the Nazis, to the point of laying down their lives for those who were suffering? Choose three students to creatively reenact what happens in this story. In the ancient world, to sit at the left or right hand of a ruler was a position of authority and implied some participation in the experience of rule. What do you think the disciples imagined it would be like to “sit at Jesus’ left and right hand”? Jesus asks whether they are willing to share in the events that Jesus is about to experience (v.38)? Why do you think they are willing to agree? What is the model of “greatness” that Jesus outlines in v.41-45? Jesus says he has come to give his life as a ransom for many. What do you think he is talking about? What do you think Jesus means by this? What is your reaction to this teaching? Jesus presents leadership as an act of servanthood. What do you think of the model espoused by him and followed by Dietrich Bonhoeffer and the Confessing Church? 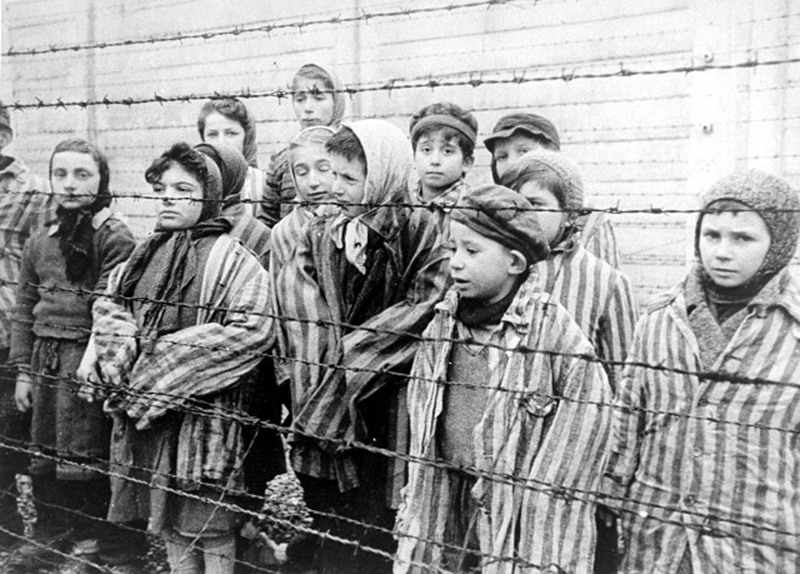 Can you think of any examples (other than the church under Nazism) of when Christians have ignored or failed to stand against evil and injustice in order to maintain their power and comfort? Simon Smart says that Bonhoeffer was characterised by “sacrifice, service, affinity with the victims, courage, and above all, humility”. Share an individual or organisation who you think embodies these values. How close are you to following their example? Research another Christian who was involved some way in resisting the Nazis, such as Martin Niemoller, Sophie Scholl, or Corrie Ten Boom. Write a one page summary of some of the key events of their life, and how their Christian faith shaped their actions.